Podcasters are always asking us, "How do I present my work and my audience so that I get the attention of really great podcast sponsors?" As we mentioned in our guide on podcast sponsorship rates, one of the most important ways creators can get quality sponsors is by knowing who their listeners are. If you have an audience in the tens of thousands or more, doing a listener survey to understand who's tuning in should be one of the first steps you take toward podcast sponsorship. Many sponsors will want to see this kind of data before discussing any kind of sponsorship deal. So today we'll discuss why it's so crucial to do a survey, how easy it is to set one up, and what creators should be asking their audiences. Demographics. Companies want to advertise on podcasts that know the demographic makeup of their audience. This is common across all types of media - marketing departments target their campaigns at key demographic segments of the population. Age, gender, income level, familial status, location, and profession are the kinds of information sponsors want to know about. For example, if you conduct a survey of your audience and find a majority of them are men who work in white collar professions, then a custom suit company might love to work with you. Without this kind of data, advertisers can't be sure which types of audiences are hearing their ad spots. Purchasing interests. Listener surveys can also help you understand the purchasing patterns and preferences of your audience. Do they purchase a lot of things online? Do they express an interest in hearing about consumer electronics or apparel? These questions can tell sponsors how receptive an audience will be to their product or service, and indicates which selling points they should focus on in their ad copy. Industry-specific audiences.Where do your listeners work? 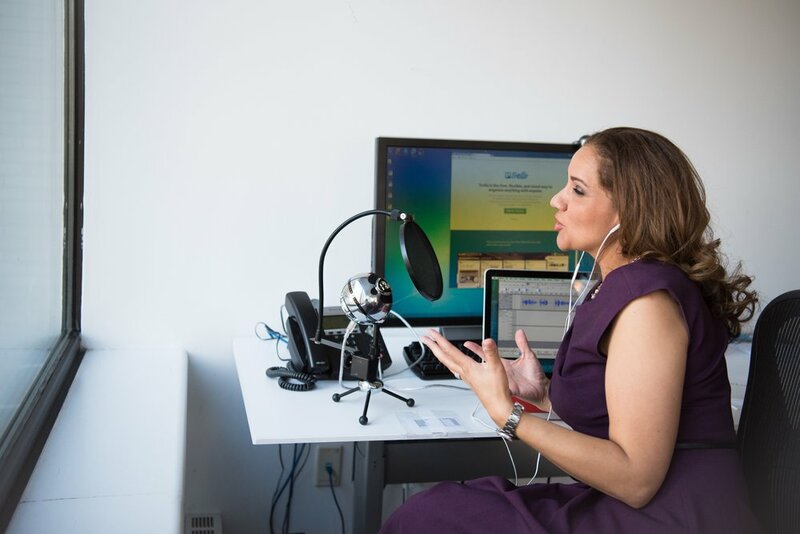 Many niche podcasts attract listeners who work in specific industries, like software development, national security and defense, the law or healthcare. If your survey finds you have a high number of professionals in a particular industry, you can approach industry-specific sponsors with a great offer. For example, if you have lots of software developers listening to your podcast, companies that provide staffing services for technology workers or products that make software development easier are great options for your audience. Engagement. Surveys can prove listeners are engaged with your podcast, simply based off the number of survey responses you receive. If you estimate you receive 20,000 listens per episode and you get 2,000 responses to your survey after mentioning it on your podcast, that's 10% - an excellent response rate. And the more responses you get, the more accurate your data is and the more conclusions you can draw from it. And of course, a high engagement rate for a listener survey indicates that your audience is more likely to respond to an ad campaign on your podcast. Show feedback. Lastly, a survey gives you the opportunity to ask for feedback on your content. You should always be thinking about how to improve your show, attract and retain listeners, and create high-quality content. Hearing directly from listeners about their thoughts on your show's format, topics, guests, and length all help create a virtuous cycle of feedback, improvement, and further engagement. Google Forms. Create your survey as a standalone Google form separate from your website. It's straightforward to create your questions and build the survey in about ten minutes. Google offers a lot of customization options, from the format of your questions (short answer, checkbox, drop down menu) to the color and text font. If you want to place a link to your survey right in your show notes that listeners can complete on their phones, this is a great option. SurveyMonkey. One of the largest survey sites on the Web, SurveyMonkey's Basic plan lets you create one survey in just a few minutes. To get started, visit their home page and click Sign Up. Once you've done that, hit "Create Survey" and it will take you to the survey builder. You can also pick from their template options. Note that the Basic plan has a number of limitations - you can only do a maximum of ten questions and view the first 100 responses to your survey. If you expect more responses than that, it might be best to go with another service or upgrade to their paid plan. Typeform. A more stylish survey provider, often used by companies for client and employee feedback. You can get started with their Basic free plan in under a minute. Typeform sets itself apart by the look of its survey - as listeners answer questions, it scrolls down one by one, so listeners only ever see one question at a time and don't get distracted. Typeform has similar restrictions to SurveyMonkey - the free plan includes ten questions and 100 responses. Squarespace Form Block. If you already use Squarespace for your podcast's website, you can easily create a new page and create a survey with the Form Block (Add a Block, then go to "More" and select "Form"). Squarespace makes it easy to create a short listener survey, complete with different types of question formats, as well as a location for where survey responses should be stored. Unsure what exactly you need to ask your listeners in the survey? Your goal should be to get enough information to form a detailed picture of who's listening, focusing on those attributes we mentioned earlier. In speaking with potential sponsors, you should be able to give a biography of a typical listener of your show - who they are, what they do, how much money they make, etc. Most questions in a listener survey are valuable for any podcast - we've added some below, feel free to use them! But creators should be sure to build on this list and ask questions that are unique to their show's topic and who they think their audience is. How many children do you have in your household? Now that you've made your listener survey, you have to make sure you publicize it. When your survey is live and ready for responses, you must mention it on your show as something you'd like your listeners to fill out. Mention it for at least two or three episodes, and give listeners a deadline by which to get in their responses (this also is helpful when listeners hear the episode months or years in the future, so that they don't go looking for it). Furthermore, make it easy for listeners to find the survey. Create a custom URL (using a free service like bitly.com or tinyurl.com) so that you can mention the link in your podcast, e.g. 'go to bitly.com/InvestorShowSurvey and fill out our two minute survey form!' Then, put this custom link in your podcast show notes where listeners will immediately see it.prominently and clearly. Indicate how long the survey will take (and be honest). In your podcast and in the show notes, explain why you're conducting the survey and how it will be beneficial for the growth of the podcast. Give yourself a few weeks after publishing the survey before you collect and analyze the data. Look for trends in listeners' responses, particularly their age, income, profession, and buying preferences. These are the most important points for sponsors. With this data, you'll be much better prepared to speak to podcast sponsors about your show. Sponsors want to be assured they're reaching valuable customers. The more you know about your listeners, the better you can show that they're the ideal audience for a sponsor's product. Ready to make your survey? By now, you can see how valuable surveys are for podcast creators of all stripes. Ready to make your own listener survey? We've done the hard work and made a detailed guide that goes through each step of the process. If you've got 20 minutes and want to create your podcast's first listener survey, go read our guide "How to Create Your Podcast Listener Survey". Podcast creators who partner with Backyard Media for their advertising needs get guidance on all aspects of running a podcast business. More importantly, Backyard Media serves as an advocate for creators. We approach sponsors and pitch them on our partners' shows. If you're a podcast creator and you want to find great sponsors without spending countless hours cold-emailing companies, consider partnering with us! To get started, get in touch with us by clicking here.